appears to be unrelated to any other language family. Amazonianist Daniel Everett was the first to report on Oro Win (Chapakuran) as a separate language (Everett 1994). It had gone unnoticed probably because all Oro Win speakers also speak the closely related Wari' language, identify themselves as Wari' and are very few 40-50 half a century ago and only a handful left now speaking the language. Dahalík, as a separate Semitic language of three islands of Eritrea, was uncovered by a French survey in 1996 (Simeone-Senelle 2005). Africanist Bernd Heine set out to look for Omotik, a South Nilotic language, after two anthropologists had informed him there were speakers in the southern part of the Mau forest in Kenya. He finally found a speaker who, however, turned out not to be Omotik but spoke a thitherto unknown related language called Sogoo (Heine 1973, 38-39). Heine was also the rst to document Elmolo, a Cushitic language with only 8 remaining speakers in the 1970s, though there was a previous ethnographic description of the Elmolo (Heine 1976). 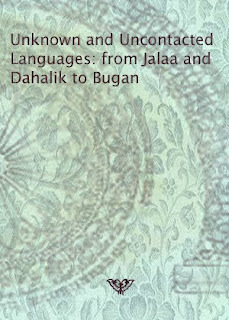 Paul Doornbos did ethnographic fieldwork in the Wadai-Darfur area (Sudan-Chad-CAR) in the late 1970s and, apart from correcting and elucidating previous accounts, was able to report on previously unknown languages, including the enigmatic Kujargé language (Doornbos and Bender 1983). Laal is another enigmatic language in Chad which was unknown to linguists before 1974 (Boyeldieu 1982). The brilliant Khoesaanist Anthony Traill (now deceased) discovered the thitherto unrecorded Bushman language Hùã around 1973 in Botswana (Traill 1973). It had gone unnoticed partly because the speakers were living among other Bushmen whose languages were known. Probably the last new languages to discovered in Mesoamerica, e.g. Teco (Mayan), are covered by Kaufman and Campbell (Kaufman 1969; Kaufman 1974; Campbell 1979; Campbell 1997). Zirenkel (in Chad), an unreported language separate from Mubi (East Chadic), was found in a 2001 survey (Johnson 2006). Likewise, Mabire (also a Chadic language in Chad), now spoken only by a few elderly people, was first mentioned to an SIL linguist in 1993 (Johnson and Hamm 2002). Bugan, a Mon-Khmer language of China, was discovered in the 1990s (Li 1996). The linguistic atlas of Cameroon (Dieu and Renaud 1983) mentioned two small areas bordering Nigeria that had not been covered because of dificulty of access. One could be reached by plane and a 67 km walk through the forest, but for the other, plane and foot was not a viable option (landing strip too far away). So, in 1984, Roland Breton and associates arrived in the Furu-Awa area by helicopter and asserted the existence of five new languages, three of which in immediate danger of extinction (Breton 1995). Connell (Connell 1998) gives information on other previously unknown extinct or almost extinct languages of another part of the Nigeria-Cameroon borderland (Eumu, Kad, Sianni). Kundal Shahi, an Indo-European language close to Hindko, was discovered by a survey team in northern Azad Kashmir in Pakistan administered Kashmir in 1989 (Rehman and Baart 2005). Another language unknown to linguists until 1989 in northern Pakistan is Ushojo (Decker 1992). Except as just a name among many, the existence of Kham (with 40-50.000 speakers!) in Nepal was not known until the 1960s (Watters 2002) when announced by an American anthropologist. Bisu in northern Thailand escaped attention until the 1970s (Nishida 1973). In the 1990s, the leading Himalayan linguist George van Driem discovered Black Mountain and Gongduk, two Sino-Tibetan languages, in the first ever (!) linguistic survey of Bhutan (van Driem 2001). The Zuruaha in the Amazon were not contacted until 1980 before which their Arawán language was not known (Kroemer 1990). The existence of a separate language language of the hunting and gathering Nukak of the Colombian Amazon was appreciated by missionaries sometime between 1974 and 1988. They speak a language of the poorly known Kakua-Nukak family (Cabrera, Franky, and Mahecha 1999). Jo'é, a Tupi language also in the Amazon, was appreciated no earlier than 1989 (Kaufman 1994, 72). In 1995, a small group of isolated Indians were contacted by the department of isolated Indians (of the FUNAI) in Rondônia in the Brazilian Amazon. They turned out to speak Kanoê, an already known language. However, this contact lead to the contact of a second group of Indians who speak a thitherto unknown variety labeled Akuntsun. It is not clear, however, whether this language is a dialect of Mekéns (a Tupí language of the Tupari group) or a separate language (Gabas 2005). The first documented contact with the Latundê, also in Rondônia, who speak a Nambikwaran language, was in 1976 (Price 1978). Kujumbim or Kuyubi, a Chapacuran language of Rondônia is mentioned by Grinevald (1998, 128) as a recent discovery but I have not been able to access the original documents concerning it. The discovery of Bure (West Chadic) and more by the distinguished Africanist Rudolf Leger in northern Nigeria is chronicled by Caron (2003). The Eastern Jebel language lay without study for half a century until Bender's eldwork in the late 1970s. He reported an new variety labeled Beni-Sheko (Bender 1983a; Bender 1989). However, it probably does not constitute a separate language. Gèmé, located in the Central African Republic, is listed as a new Ubangi language in Boyd and Nougayrol (1988). The name was known earlier but was assumed to represent an ethnic group speaking Ndoka, a Sara-Bongo-Baguirmi/Central Sudanic language. Peaceful contact with the Jarawa of the Andamans was established only in 1997 (Abbi 2006, 5). Currently Pramod Kumar of the Max Planck Institute for Evolutionary Anthropology (Leipzig) is working on the first detailed study of the language. Another example is the Tause (Lakes Plain, Irian Jaya) who were not contacted until 1982 (Munnings and Munnings 1990). Bayono and Awbono, forming a small family in Irian Jaya, appear in the latest editions of the Ethnologue, but not in earlier listings over Irian Jaya, so they are presumably discoveries from the 1990s. Ainbai, a new language of the Border family, was discovered around 1980 in a survey of Pagi and Kilmeri in the West Sepik (Sandaun) province of Papua New Guinea (Brown 1981). Previously unreported dialects/ethnic groups continue to be discovered even in Eurasia, such as the Ili Turk of Northwestern China, who speak an almost extinct Turkic dialect (Xiangrú and Hahn 1989). The most famous known uncontacted tribe is probably the North Sentinelese of the Andaman Islands, India. They have refused contact right from the earliest accounts, showing hostility to anyone who approaches their island. An attempt at contact in the 1990s at which there was actually an (initially) peaceful exchange of gifts was later aborted. At present the authorities have no further plans to initiate contact (Kumar 2000). Irian Jaya, as of reports from the 1990s, harbours uncontacted peoples in the headwaters of Wapoga river, near Lakes Plain region (Clouse 1993, 2) (de Vries 1993, 1) and north of the upper Digul river, mid-southwest Irian Jaya (de Vries and van Enk 1997, 5).